I bring the sad news that Brian Williams (1959-1978) died peacefully this morning at the Stewton House Nursing Home in Louth where he had been transferred to from hospital so that he could be close to Margaret and their home together. I visited Brian and Margaret last Friday afternoon and I was able to pass on all the good wishes and recollections that Briggensians had sent to me; Brian was able to thank everyone for their kind thoughts and messages but soon slipped back into sleep. His medication was keeping him free from pain and he was still taking water but not food. I will let members know when the funeral has been arranged; typically Brian had chosen his own service down to the last detail. Margaret was much better than I had expected following her stroke last July and was able to get to see Brian in the nursing home with the support of her walking frame. The family were taking it in turn at staying with Margaret so that one of them was there at all times to help and support. It was Tim who broke the sad news this morning. I have learned today that the funeral will be held at 1.00pm on Friday, 6th December 2013 at St. James Church, Louth. This will be followed by his internment for family only. The family would like as many of those attending as are able to remain for refreshments which will be available locally. Those Briggensians who wish to send reflections for the Newsletter on school days especially in connection with Brian are encouraged to email me. In January this year, my wife, Eileen, and I made one of our frequent visits to Edinburgh. Fortunately the weather at the time was kind to us. 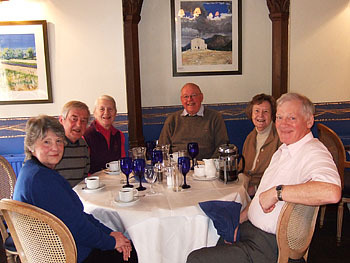 Whilst there we met up with Charlie and Marion Windass and John and Marguerite Sellars. We had a very pleasant lunch and spent the afternoon together. Most readers will know of Charlie Windass (1946-54) who was in School House with me. John Sellars (1945-53) was in Nelthorpe House and we both went up to Manchester University together. His wife Marguerite was at the High School at Brigg. I have been trying to persuade John to attend the Annual Dinner but with no success so far! ... and Air Crashes, Bombs and Pirates: Half a Century at Sea! Having recently stumbled across the "Briggensians" site what a flood of memories they revived. Tea in the boarding house at 1545 also stand out stuffing bread and dripping down our gullets at an alarming rate. We had a four miles "out of bounds " rule which enforced an iron curtain around Brigg, a limit which we were not to exceed, but I recall many a time cycling to my aunts nursing home in Nettleton on a Wednesday or Saturday afternoons (twagging the compulsory attendance at the current football or cricket match!) just to have an afternoon of gluttony and music! Fellow boarders Martin B. Thomas and Thomas Frank accompanied me if I recall and on a few occasions we made it back just in time for "prep!" If my memory serves me correctly our Masters were N.C Mathews (Slugg-headmaster); Bumper Knight; Doggy Barker; Viv Atkins: Jock McKendrick; Paddy Paisley: Jezza Bell; Tigga Richards: Digger Payne: Rufus Pratt; Gregory Peck: Gordon Hogg; Archie Moore; Jock Longden; Tinker Thumwood; Mr. Chips; Jonesey; Harry Pimlott; Jimmy Jarvis; Mr. Stinson; Pawn Butterworth; Woody and I am sure I have missed a couple! We used to have a "general book" which was really a rough book which had to be signed when full, but underwent intense scrutiny to see in there was any usable space left in it before being issued with a new one. Cross country runs used to consist of the "Brickyard Lane" run which was about 3 1/2 miles and the "Kettlewell" run which must have been close to 6 miles. Times taken varied upon a combination of how many illegal cigarettes one had smoked and athleticism. The "breaking the ice" swim on Sunday mornings in the old water boatman infested swimming pool used to be a daunting experience, but on the plus side the extra lie in (fifteen minutes) seemed like heaven in a warm bed, despite the dormitories being unheated. All too quickly five years evaporated and I went to work as a Research Chemist Assistant in a local chemical research labs then in 1960 I signed indentures for a shipping company and to this day I am still a Master in the Merchant Navy! My 51 years at sea have seen me weather a few storms but also see and partake in some incredible events.The Iran/Iraq war provided enough anecdotes to fill a book; my two airplane crashes on the same evening in Frankfurt while proceeding on leave should have put me off flying, but they were followed by two ditched helicopter landings in the paddy fields of Indonesia! Bomb attacks by both Iraqi and Iranian bombers on Christmas and Boxing Day should have have warned me not to sail in war zones, but I was in short supply of stories to tell my grandchildren! Peacetime in Brasil was no better as local pirates drugged and robbed me of several thousand dollars while at anchor off Salvador, but I was informed of my good luck as the Norwegian Captain of the ship a few cables away had had his throat cut as well as being robbed! The more fondly remembered times bring visions of Pacific sunsets, Dolphin families swimming alongside in tropical waters, Albatross following the ship for endless days around Cape Horn never once flapping their wings, just endless graceful gliding; countless men I have sailed with from far off lands, India, China, Malaysia, Australia, Thailand, Indonesia, Spain, Portugal, Africa, South America, USA, Iceland, Faroes and countless others, such a blend of cultures and religions. Half a century later, I still am thankful of the education that Brigg gave me and recall those far off days as if they were yesterday. 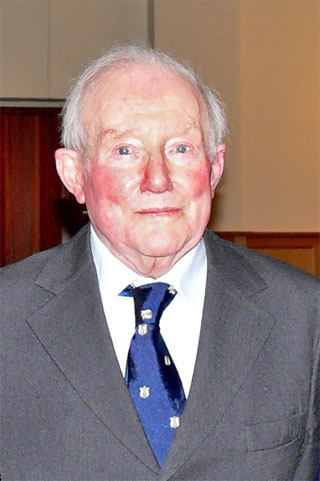 Mr Porter's daughter has informed us of his passing at the age of 93 and very kindly sent in a short account of his life along with three photos of different stages of his life at school, in the RAF and in later years. The Briggensians site will be handed over to another "minder" in 2012. Check back for the changes.